What Pallet Racking Should You Get? - Find out by downloading our free chart. We know it can be confusing when you’re looking at pallet racking. There are so many different systems which offer different solutions, and it’s not always clear what system will work best for you. Whether it is Racking out a new warehouse or improving an existing system, BSE UK will work with you to create the most efficient system for your warehouse operations. 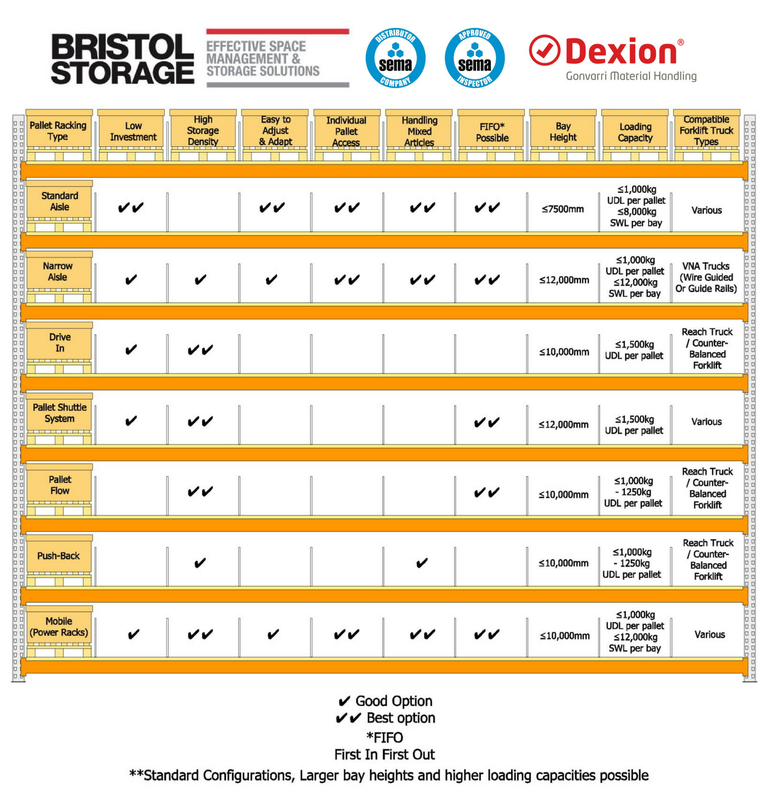 Download our simple free chart to help you decide what pallet racking would help you be more efficient. Standard Aisle - Affordable, and versatile, standard aisle pallet racking is perfect for most warehouses and is compatible with standard forklifts. Narrow Aisle – Narrow isle pallet racking increases your storage by squeezing the aisles together and utilising height, perfect for warehouses that don’t have a big square footage. Drive In – Using a similar principle to block stacking, drive in pallet racking is a brilliant option for bulk storage. Pallet Shuttle System – Similar to drive in or pallet flow systems, Pallet shuttle enables high density storage. This Semi-Automated system handles goods inside the racking. This eliminates the need for forklifts to enter the racks. Pallet Flow – Working on a first in last out principle, pallet flow is good for high density storage and enables easy access to goods. Push Back – This high density storage system, maximises floor space by using a block stacking method very similar to Drive in Racking. Mobile Power Racks – Uses Conventional pallet racking on motorised rails, allowing you to assess and area at specific request. Giving you versatility of Standard Aisle while minimising the use of square footage. If you have found your perfect match and need to look no further, or if your still not sure and want to talk your option over with one of our experts. You can make an enquiry Via Email [email protected] or Tel: 0117 955 5211.